Hi Friends! I have another new Gina K & Spectrum Noir tutorial to share with you today! I used all kinds of different techniques on these cards using the latest Stamp TV Kit called Sending Love. Grab a cup of coffee & come take a peek! Step 1: I stated out making a strip of background paper using the chisel tip of my Spectrum Noir Markers (HB1, HB2, HB3). Step 2: Line up a piece of cardstock on grid paper and then use a scratch piece of cardstock as a ruler or guide as you add diagonal marker lines. I started from lightest to darkest color and continued all the way down the cardstock. Tip: Half way through, you may want to flip over the scrap cardstock once it becomes saturated with ink. Tip: Overlap your marker lines slightly so there are no gaps in color. Note: I decided to make a second card using the same technique. This time I cut a piece of the pre-printed pattern black & white designer cardstock included in the Stamp TV Kit. NOTE: I changed from Spectrum Noir alcohol ink markers to Spectrum Aqua watercolor markers for this next technique. 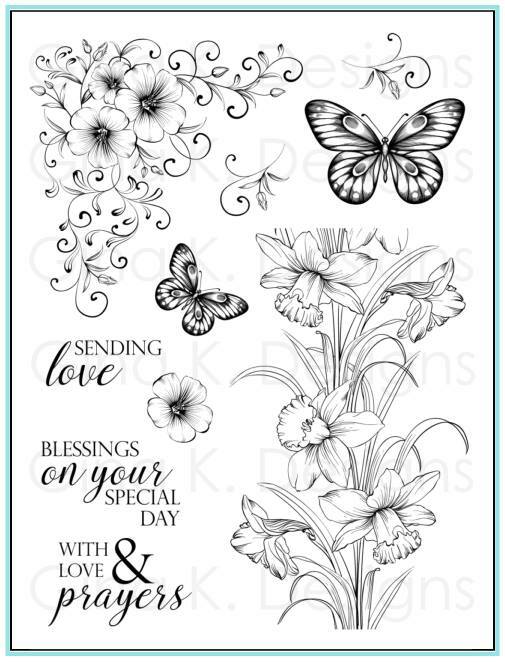 Step 3: Add Wildflower ink directly from my Spectrum Aqua marker to the entire image of the butterfly stamp. Step 4: Add Orchid ink from the marker to the outside areas of the butterfly image. Step 5: Spritz water on watercolor paper & stamp the image. I trimmed out 3 butterflies (1 large & 2 small) and added them to my card. The next technique I want to share is matching up printed sentiments. 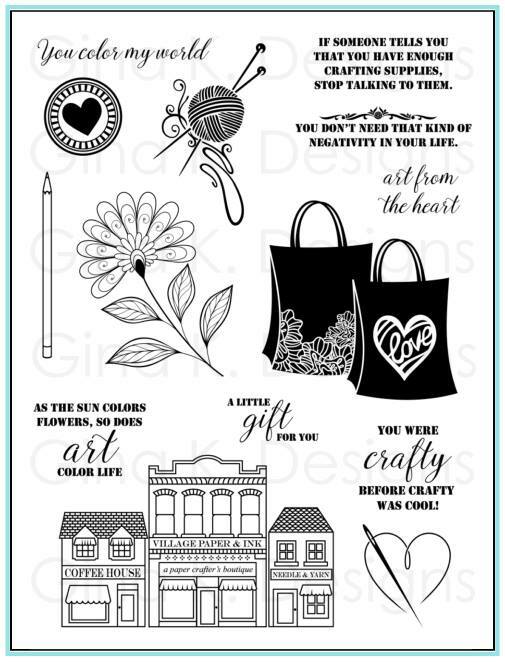 Similar to the backgrounds I did above, I decided to color the sentiments to match my cards my cards. To do this simply use the chisel tip of the Spectrum Noir Marker and swipe lines across the sentiment. TIP: Make sure to do this rather quickly and don't overlap too much so the color blends well. Step 2: Add H2 ink to the outside tips of the flower. Step 3: Repeat the HB1 marker over the entire image. Step 4: Add HB3 to the inside of the flower. Step 5: Add Spectrum Noir colored pencil (080) to the black lines of the image. Step 6: Blend with Gamsol Blending Solution and a paper blending stump. Here is a close up of my finished sentiment, rhinestones, and flowers! Great news!!! Gina K Designs is moving to a new location this week! The store is closed at the moment, but will be open soon better than ever! Hi Friends! 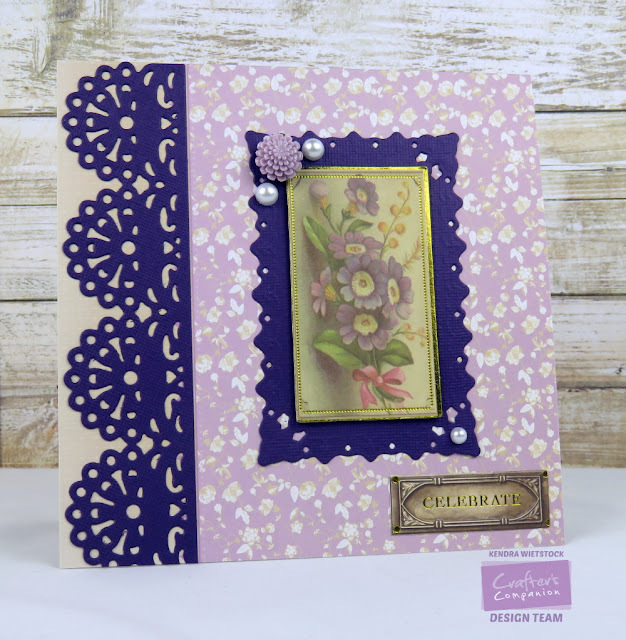 Time for a fun new card using the new Sheena Douglass set called Floral Fiesta from Crafter's Companion! I just love Sheena's flowers and every time she has a new flower set, it's the first one I use. On this flower, I used my Spectrum Noir AquaBlend Watercolor Pencils and then added a touch of sparkle with my Spectrum Noir Clear Sparkle Pen. Downton Abbey from Crafter's Companion! Do you miss Downton Abbey on TV as much as I do? Well here's a fun way to re-live the Downton days with the new Downton Abbey Papercrafting Collection from Crafter's Companion. 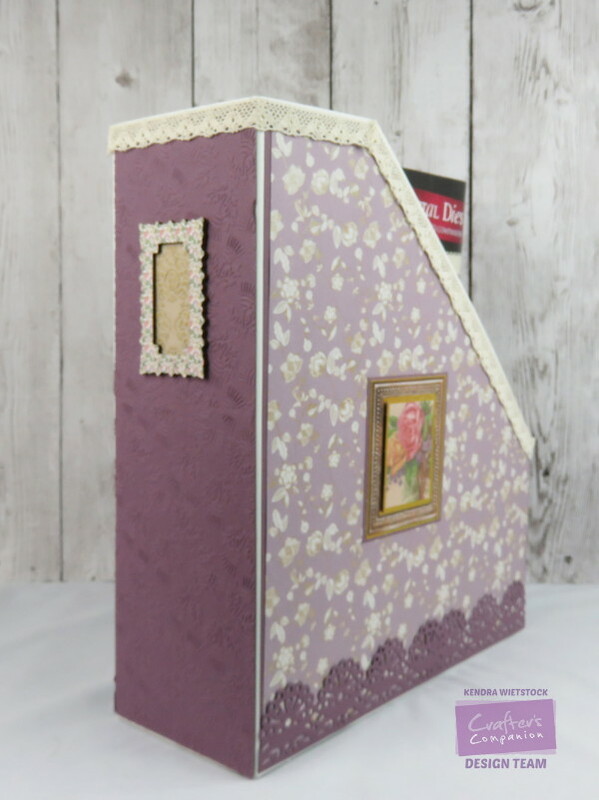 I made this card in about 5 minutes using the beautiful paper pad, dies and this pretty card topper! Easy Peasy and super elegant!!! A beautiful new Signature Collection from Sara Davies is hitting the Crafter's Companion website today & you won't want to miss it! The name of this collection is called Floral Delight and the elements are all gorgeous. Want to see more? Check out lots more beautiful creations using this new collection over on Pinterest. Graduation season is upon us and the designers for Taylored Expressions have lots of great projects to share with you this month. 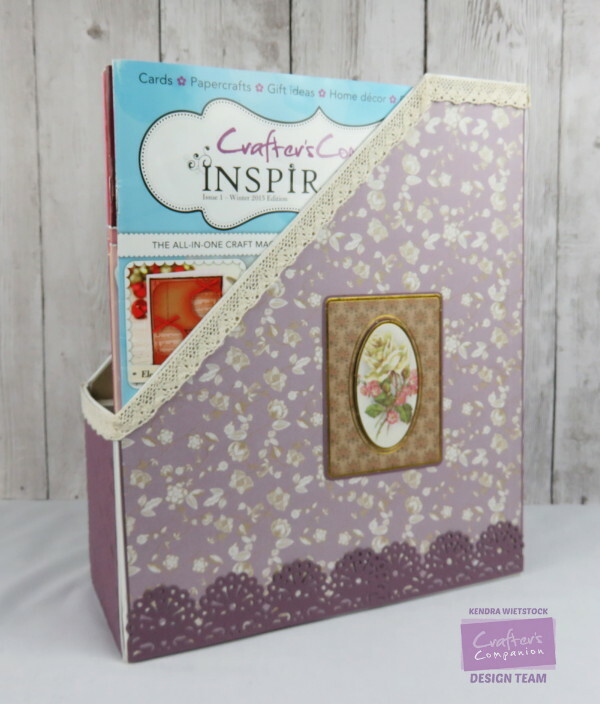 Both magazine files are decorated with supplies from the Downton Abbey Papercrafting Collection. TIP: It is very important to use a strong construction cardstock & adhesive for this project because magazines can be heavy so strong materials are needed. Gina K ~ Inspiration Blog Hop & Spectrum Noir Tutorial! 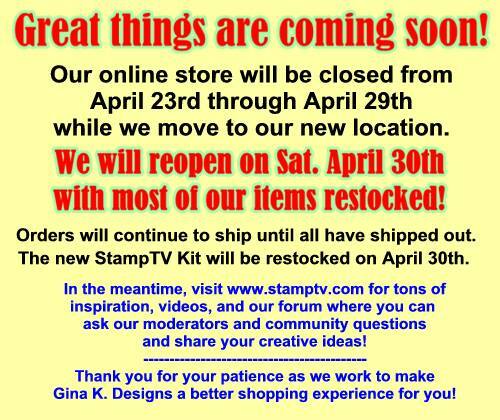 The Cast and Crew for Gina K Designs welcomes you to another fabulous blog hop celebrating the new Sending Love StampTV Kit. 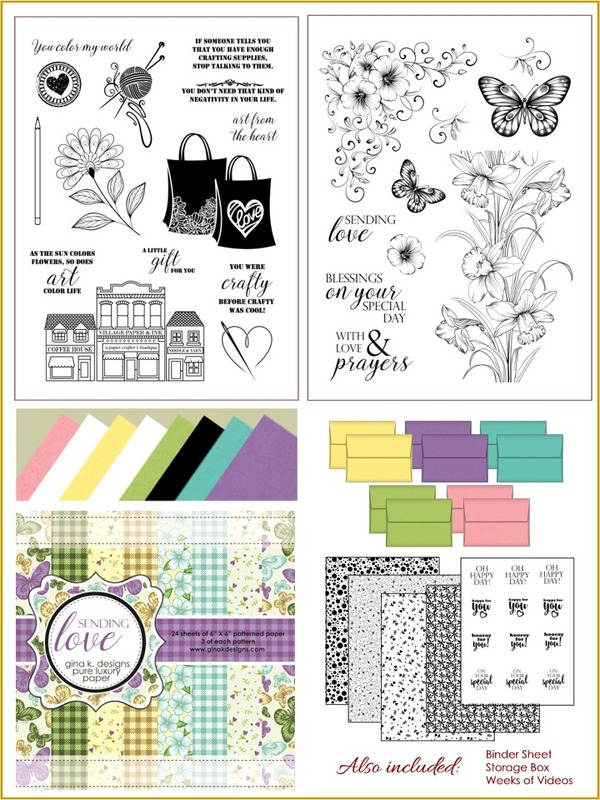 We hope to inspire you with a variety of different techniques and styles used by our Design Team featuring the stamp sets and patterned paper pack from this new kit. Enjoy the beautiful projects as you hop along with us today. The first set is called, Art from the Heart and it features an eclectic variety of images and greetings depicting crafts, art, shopping and the new Gina K headquarters called Village Paper & Ink Shop! Here's the project I put together using that image along with my Spectrum Aqua Markers and the envelopes that come with the Stamp TV Kit this month. Step #1: Stamp the image with White Pigment Ink and heat emboss with white embossing powder. Step #2: Select 3 coordinating groups of Spectrum Aqua Markers (one for each building). Step #3: Using one group of colors at a time begin with the first building and start dabbing on color directly from the marker to the image. Start with the darkest color and apply color to random spots along the left edge. Then continue with the next darkest color to the lightest. Don't forget to leave some white space (my mistake on the red/orange/yellow building). Step #4: Using a waterbrush, begin blending the colors. You will want a very wet brush for this step. Step #5: For the background, continue spreading color outside stamped image. YES ~ you have permission to color outside the lines! LOL. If you need to add more color to the background, add color directly from the Spectrum Aqua Marker to a palette along with a few drops of water and then apply the color to the artwork. By adding water, the background won't be too dark. Step #6: Once the artwork is dry, stamp the sentiment. FYI ~ you can speed up the drying process by using a heat embossing tool; however, it will curl the paper. Here's a close up of my colored image. Next, I made some inserts for the inside pockets and used the same coloring technique as above (dab on color with marker and then blend with waterbrush), but this time the images and sentiment are stamped with Staz-On Black Ink. To connect the envelopes, just slip one flap inside a second envelope and secure the two with adhesive. The second set in the Stamp TV Kit is called Sending Love. It features spring flowers and butterflies, perfect for coloring with watercoloring, markers, colored pencils and more! 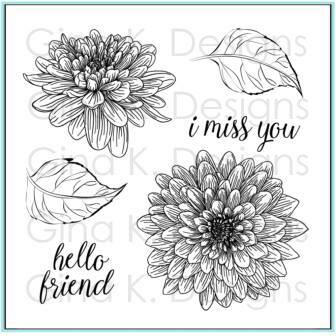 And, a photo of the brand new Incentive Set called Hello Friend. Enjoy the gorgeous inspiration samples from the team today and then comment on each blog for your chance to win a Gina K Designs gift certificate! 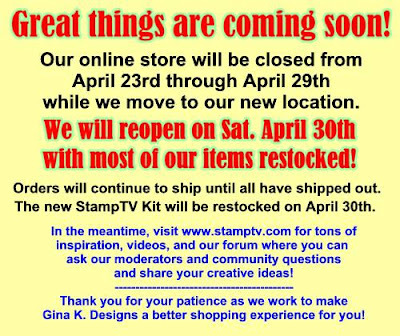 To see who won, check the Big News Forum at StampTV on Thursday, April 21st.You can find the new Sending Love StampTV Kit now in the “What’s New” section of the Gina K. Designs store. Thank you for stopping by & happy hopping! 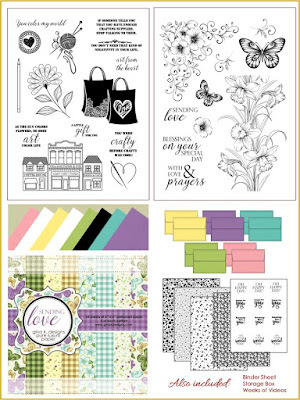 Gina K ~ New Incentive Stamp Set! Project Life: Time to Cruise!